This site hosts videos from the National 4-H Dairy Judging Contest held annually at World Dairy Expo in Madison, WI. 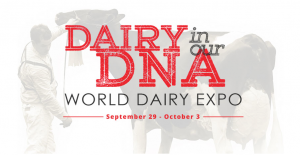 Starting in 2013, the University of Wisconsin-Extension began working with World Dairy Expo and the National 4-H Dairy Judging Contest Planning Committee to create these videos to be used as a practice tool by dairy judging teams. These video presentations includes video footage and still images of each of 4 contest animals. The presentations also include the official placing for the class and notes from the official judges indicating their reasons for placing the class. Starting with the 2014 contest, videos of the top individuals in the oral reasons category are also available. Please keep in mind when viewing these presentations that the official placings and notes were taken based on the live view of the cows and heifers at the contest. The animals may look a little different on a video screen! Also, the oral reasons that you will see were recorded the day after the contest and are not the actual set that the participant was scored on. However, they do give a good representation of high scoring reasons. Video footage for these presentations is provided by the University of Wisconsin Extension Media Services and still images for the 2014 and 2015 contests are provided by HolsteinWorld. We hope that you find these videos to be a useful learning tool for your judging team!